This article is about general methods of telegraphy. For telegraphy over conducting wires, see Electrical telegraph. For Ships' Telegraph, see Engine order telegraph. "Telegraph" redirects here. For newspapers called "Telegraph", see The Telegraph. For other uses, see Telegraph (disambiguation). Telegrams became a popular means of sending messages once telegraph prices had fallen sufficiently. Traffic was became high enough to spur the development of automated systems – teleprinters and punched tape transmission. These systems led to new telegraph codes, starting with the Baudot code. However, telegrams were never able to compete with the letter post on price, and competition from the telephone, which removed their speed advantage, drove the telegraph into decline from 1920 onwards. The few remaining telegraph applications were largely taken over by alternatives on the internet towards the end of the twentieth century. 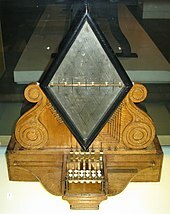 The word "telegraph" (from Ancient Greek: τῆλε, têle, "at a distance" and γράφειν, gráphein, "to write") was first coined by the French inventor of the Semaphore telegraph, Claude Chappe, who also coined the word "semaphore". A "telegraph" is a device for transmitting and receiving messages over long distances, i.e., for telegraphy. The word "telegraph" alone now generally refers to an electrical telegraph. Wireless telegraphy is transmission of messages over radio with telegraphic codes. Contrary to the extensive definition used by Chappe, Morse argued that the term telegraph can strictly be applied only to systems that transmit and record messages at a distance. This is to be distinguished from semaphore, which merely transmits messages. Smoke signals, for instance, are to be considered semaphore, not telegraph. According to Morse, telegraph dates only from 1832 when Pavel Schilling invented one of the earliest electrical telegraphs. A telegraph message sent by an electrical telegraph operator or telegrapher using Morse code (or a printing telegraph operator using plain text) was known as a telegram. A cablegram was a message sent by a submarine telegraph cable, often shortened to a cable or a wire. Later, a Telex was a message sent by a Telex network, a switched network of teleprinters similar to a telephone network. A wire picture or wire photo was a newspaper picture that was sent from a remote location by a facsimile telegraph. A diplomatic telegram, also known as a diplomatic cable, is the term given to a confidential communication between a diplomatic mission and the foreign ministry of its parent country. These continue to be called telegrams or cables regardless of the method used for transmission. Passing messages by signalling over distance is an ancient practice. One of the oldest examples is the signal towers of the Great Wall of China. In 400 BC, signals could be sent by beacon fires or drum beats. By 200 BC complex flag signalling had developed, and by the Han dynasty (200 BC–220 AD) signallers had a choice of lights, flags, or gunshots to send signals. By the Tang dynasty (618–907) a message could be sent 700 miles in 24 hours. The Ming dynasty (1368–1644) added artillery to the possible signals. While the signalling was complex (for instance, different-coloured flags could be used to indicate enemy strength), only predetermined messages could be sent. The Chinese signalling system extended well beyond the Great Wall. Signal towers away from the wall were used to give early warning of an attack. Others were built even further out as part of the protection of trade routes, especially the Silk Road. Signal fires were widely used in Europe and elsewhere for military purposes. The Roman army made frequent use of them, as did their enemies, and the remains of some of the stations still exist. Few details have been recorded of European/Mediterranean signalling systems and the possible messages. One of the few for which details are known is a system invented by Aeneas Tacticus (4th century BC). Tacitus's system had water filled pots at the two signal stations which were drained in synchronisation. Annotation on a floating scale indicated which message was being sent or received. Signals sent by means of torches indicated when to start and stop draining to keep the synchronisation. None of the signalling systems discussed above are true telegraphs in the sense of a system that can transmit arbitrary messages over arbitrary distances. Lines of signalling relay stations can send messages to any required distance, but all these systems are limited to one extent or another in the range of messages that they can send. A system like flag semaphore, with an alphabetic code, can certainly send any given message, but the system is designed for short-range communication between two persons. An engine order telegraph, used to send instructions from the bridge of a ship to the engine room, fails to meet both criteria; it has a limited distance and very simple message set. There was only one ancient signalling system described that does meet these criteria. That was a system using the Polybius square to encode an alphabet. Polybius (2nd century BC) suggested using two successive groups of torches to identify the coordinates of the letter of the alphabet being transmitted. The number of said torches held up signalled the grid square that contained the letter. The system would have been very slow for military purposes and there is no record of it ever being used. 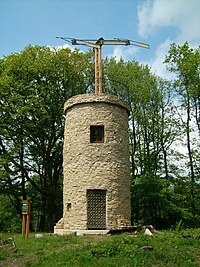 An optical telegraph, or semaphore telegraph is a telegraph consisting of a line of stations in towers or natural high points which signal to each other by means of shutters or paddles. Early proposals for an optical telegraph system were made to the Royal Society by Robert Hooke in 1684 and were first implemented on an experimental level by Sir Richard Lovell Edgeworth in 1767. The first successful optical telegraph network was invented by Claude Chappe and operated in France from 1793 to 1846. During 1790–1795, at the height of the French Revolution, France needed a swift and reliable communication system to thwart the war efforts of its enemies. In 1790, the Chappe brothers set about devising a system of communication that would allow the central government to receive intelligence and to transmit orders in the shortest possible time. On 2 March 1791, at 11 am, they sent the message "si vous réussissez, vous serez bientôt couverts de gloire" (If you succeed, you will soon bask in glory) between Brulon and Parce, a distance of 16 kilometres (9.9 mi). The first means used a combination of black and white panels, clocks, telescopes, and codebooks to send their message. In 1792, Claude was appointed Ingénieur-Télégraphiste and charged with establishing a line of stations between Paris and Lille, a distance of 230 kilometres (about 143 miles). It was used to carry dispatches for the war between France and Austria. In 1794, it brought news of a French capture of Condé-sur-l'Escaut from the Austrians less than an hour after it occurred. The Prussian system was put into effect in the 1830s. However, they were highly dependent on good weather and daylight to work and even then could accommodate only about two words per minute. The last commercial semaphore link ceased operation in Sweden in 1880. As of 1895, France still operated coastal commercial semaphore telegraph stations, for ship-to-shore communication. Eventually, electrostatic telegraphs were abandoned in favour of electromagnetic systems. An early experimental system (Schilling, 1832) led to a proposal to establish a telegraph between St Petersburg and Kronstadt, but it was never completed. The first electric telegraph in regular use (Gauss and Weber, 1833) connected Göttingen Observatory to the Institute of Physics about 1 km away. Most of the early electrical systems required multiple wires (Ronalds' system was an exception), but the system developed in the United States by Morse and Vail was a single-wire system. This was the system that first used the soon-to-become-ubiquitous Morse code. By 1844, the Morse system connected Baltimore to Washington, and by 1861 the west coast of the continent was connected to the east coast. 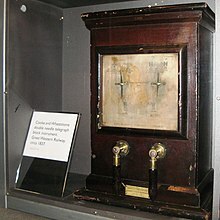 The Cooke and Wheatstone telegraph, in a series of improvements, also ended up with a one-wire system, but still using their own code and needle displays. The electric telegraph quickly became a means of more general communication. The Morse system was officially adopted as the standard for continental European telegraphy in 1851 with a revised code, which later became the basis of International Morse Code. However, Great Britain and the British Empire continued to use the Cooke and Wheatstone system, in some places as late as the 1930s. Likewise, the United States continued to use American Morse code internally, requiring translation operators skilled in both codes for international messages. Railway signal telegraphy was developed in Britain from the 1840s onward. It was used to manage railway traffic and to prevent accidents as part of the railway signalling system. 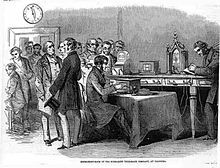 On June 12, 1837 Cooke and Wheatstone were awarded a patent for an electric telegraph. This was demonstrated between Euston railway station – where Wheatstone was located – and the engine house at Camden Town – where Cooke was stationed, together with Robert Stephenson, the London and Birmingham Railway line's chief engineer. The messages were for the operation of the rope-haulage system for pulling trains up the 1 in 77 bank. The world’s first permanent railway telegraph was completed in July 1839 between London Paddington and West Drayton on the Great Western Railway with an electric telegraph using a four-needle system. The concept of a signalling "block" system was proposed by Cooke in 1842. Railway signal telegraphy did not change in essence from Cooke's initial concept for more than a century. In this system each line of railway was divided into sections or blocks of several miles length. Entry to and exit from the block was to be authorised by electric telegraph and signalled by the line-side semaphore signals, so that only a single train could occupy the rails. In Cooke's original system, a single-needle telegraph was adapted to indicate just two messages: "Line Clear" and "Line Blocked". The signaller would adjust his line-side signals accordingly. As first implemented in 1844 each station had as many needles as there were stations on the line, giving a complete picture of the traffic. As lines expanded, a sequence of pairs of single-needle instruments were adopted, one pair for each block in each direction. A heliograph is a telegraph that transmits messages by flashing sunlight with a mirror, usually using Morse code. The idea for a telegraph of this type was first proposed as a modification of surveying equipment (Gauss, 1821). Various uses of mirrors were made for communication in the following years, mostly for military purposes, but the first device to become widely used was a heliograph with a moveable mirror (Mance, 1869). The system was used by the French during the Siege of Paris (1870–71), with night-time signalling using kerosene lamps as the source of light. An improved version (Begbie, 1870) was used by British military in many colonial wars, including the Anglo-Zulu War (1879). At some point, a morse key was added to the apparatus to give the operator the same degree of control as in the electric telegraph. Another type of heliograph was the heliostat fitted with a Colomb shutter. The heliostat was essentially a surveying instrument with a fixed mirror and so could not transmit a code by itself. The term heliostat is sometimes used as a synonym for heliograph because of this origin. The Colomb shutter (Bolton and Colomb, 1862) was originally invented to enable the transmission of morse code by signal lamp between Royal Navy ships at sea. The heliograph was heavily used by Nelson A. Miles in Arizona and New Mexico after he took over command (1886) of the fight against Geronimo and other Apache bands in the Apache Wars. Miles had previously set up the first heliograph line in the US between Fort Keogh and Fort Custer in Montana. He used the heliograph to fill in vast, thinly populated areas that were not covered by the electric telegraph. Twenty-six stations covered an area 200 by 300 miles. In a test of the system, a message was relayed 400 miles in four hours. Miles' enemies used smoke signals and flashes of sunlight from metal, but lacked a sophisticated telegraph code. 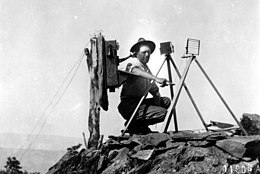 The heliograph was ideal for use in the American Southwest due to its clear air and mountainous terrain on which stations could be located. It was found necessary to lengthen the morse dash (which is much shorter in American Morse code than in the modern International Morse code) to aid differentiating from the morse dot. Use of the heliograph declined from 1915 onwards, but remained in service in Britain and British Commonwealth countries for some time. 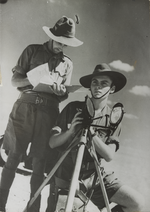 Australian forces used the heliograph as late as 1942 in the Western Desert Campaign of World War II. Some form of heliograph was used by the mujahideen in the Soviet–Afghan War (1979-1989). A teleprinter is a telegraph machine that can send messages from a typewriter-like keyboard and print incoming messages in readable text with no need for the operators to be trained in the telegraph code used on the line. It developed from various earlier printing telegraphs and resulted in improved transmission speeds. The Morse telegraph (1837) was originally conceived as a system marking indentations on paper tape. A chemical telegraph making blue marks improved the speed of recording (Bain, 1846), but was retarded by a patent challenge from Morse. The first true printing telegraph (that is printing in plain text) used a spinning wheel of types in the manner of a daisy wheel printer (House, 1846, improved by Hughes, 1855). The system was adopted by Western Union. 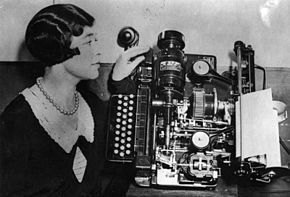 Early teleprinters used the Baudot code, a five-bit sequential binary code. This was a telegraph code developed for use on the French telegraph using a five-key keyboard (Baudot, 1874). Teleprinters generated the same code from a full alphanumeric keyboard. A feature of the Baudot code, and subsequent telegraph codes, was that, unlike Morse code, every character has a code of the same length making it more machine friendly. 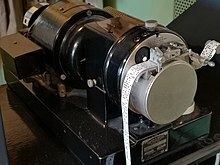 The Baudot code was used on the earliest ticker tape machines (Calahan, 1867), a system for mass distributing stock price information. In a punched-tape system, the message is first typed onto punched tape using the code of the telegraph system—Morse code for instance. It is then, either immediately or at some later time, run through a transmission machine which sends the message to the telegraph network. Multiple messages can be sequentially recorded on the same run of tape. The advantage of doing this is that messages can be sent at a steady, fast rate making maximum use of the available telegraph lines. The economic advantage of doing this is greatest on long, busy routes where the cost of the extra step of preparing the tape is outweighed by the cost of providing more telegraph lines. The first machine to use punched tape was Bain's teleprinter (Bain, 1843), but the system saw only limited use. Later versions of Bain's system achieved speeds up to 1000 words per minute, far faster than a human operator could achieve. The first message is received by the Submarine Telegraph Company in London from Paris on the Foy-Breguet instrument in 1851. The equipment in the background is a Cooke and Wheatstone set for onward transmission. A worldwide communication network meant that telegraph cables would have to be laid across oceans. On land cables could be run uninsulated suspended from poles. Underwater, a good insulator that was both flexible and capable of resisting the ingress of seawater was required, and at first this was not available. A solution presented itself with gutta-percha, a natural rubber from the Palaquium gutta tree, after William Montgomerie sent samples to London from Singapore in 1843. The new material was tested by Michael Faraday and in 1845 Wheatstone suggested that it should be used on the cable planned between Dover and Calais by John Watkins Brett. The idea was proved viable when the South Eastern Railway company successfully tested a two-mile gutta-percha insulated cable with telegraph messages to a ship off the coast of Folkstone. The cable to France was laid in 1850 but was almost immediately severed by a French fishing vessel. It was relaid the next year and connections to Ireland and the Low Countries soon followed. Getting a cable across the Atlantic Ocean proved much more difficult. The Atlantic Telegraph Company, formed in London in 1856, had several failed attempts. A cable laid in 1858 worked poorly for a few days before being destroyed by applying too high a voltage. The slow speed of transmission of this cable (sometimes all day to send a message) prompted Lord Kelvin and Oliver Heaviside to find better mathematical descriptions of long transmission lines. The company finally succeeded in 1866 with the ship SS Great Eastern and an improved cable construction. An overland telegraph from Britain to India was first connected in 1866 but was unreliable so a submarine telegraph cable was connected in 1870. Several telegraph companies were combined to form the Eastern Telegraph Company in 1872. Australia was first linked to the rest of the world in October 1872 by a submarine telegraph cable at Darwin. From the 1850s until well into the 20th century, British submarine cable systems dominated the world system. This was set out as a formal strategic goal, which became known as the All Red Line. In 1896, there were thirty cable-laying ships in the world and twenty-four of them were owned by British companies. In 1892, British companies owned and operated two-thirds of the world's cables and by 1923, their share was still 42.7 percent. During World War I, Britain's telegraph communications were almost completely uninterrupted while it was able to quickly cut Germany's cables worldwide. In 1843, Scottish inventor Alexander Bain invented a device that could be considered the first facsimile machine. He called his invention a "recording telegraph". Bain's telegraph was able to transmit images by electrical wires. Frederick Bakewell made several improvements on Bain's design and demonstrated a telefax machine. In 1855, an Italian abbot, Giovanni Caselli, also created an electric telegraph that could transmit images. Caselli called his invention "Pantelegraph". Pantelegraph was successfully tested and approved for a telegraph line between Paris and Lyon. In 1881, English inventor Shelford Bidwell constructed the scanning phototelegraph that was the first telefax machine to scan any two-dimensional original, not requiring manual plotting or drawing. Around 1900, German physicist Arthur Korn invented the Bildtelegraph widespread in continental Europe especially since a widely noticed transmission of a wanted-person photograph from Paris to London in 1908 used until the wider distribution of the radiofax. Its main competitors were the Bélinographe by Édouard Belin first, then since the 1930s, the Hellschreiber, invented in 1929 by German inventor Rudolf Hell, a pioneer in mechanical image scanning and transmission. 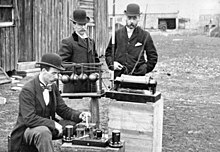 The late 1880s through to the 1890s saw the discovery and then development of a newly understood phenomenon into a form of wireless telegraphy, called Hertzian wave wireless telegraphy, radiotelegraphy, or (later) simply "radio". Between 1886 and 1888, Heinrich Rudolf Hertz published the results of his experiments where he was able to transmit electromagnetic waves (radio waves) through the air, proving James Clerk Maxwell's 1873 theory of electromagnetic radiation. Many scientists and inventors experimented with this new phenomenon but the general consensus was that these new waves (similar to light) would be just as short range as light, and, therefore, useless for long range communication. At the end of 1894, the young Italian inventor Guglielmo Marconi began working on the idea of building a commercial wireless telegraphy system based on the use of Hertzian waves (radio waves), a line of inquiry that he noted other inventors did not seem to be pursuing. Building on the ideas of previous scientists and inventors Marconi re-engineered their apparatus by trial and error attempting to build a radio-based wireless telegraphic system that would function the same as wired telegraphy. He would work on the system through 1895 in his lab and then in field tests making improvements to extend its range. After many breakthroughs, including applying the wired telegraphy concept of grounding the transmitter and receiver, Marconi was able, by early 1896, to transmit radio far beyond the short ranges that had been predicted. Having failed to interest the Italian government, the 22-year-old inventor brought his telegraphy system to Britain in 1896 and met William Preece, a Welshman, who was a major figure in the field and Chief Engineer of the General Post Office. A series of demonstrations for the British government followed—by March 1897, Marconi had transmitted Morse code signals over a distance of about 6 kilometres (3.7 mi) across Salisbury Plain. On 13 May 1897, Marconi, assisted by George Kemp, a Cardiff Post Office engineer, transmitted the first wireless signals over water to Lavernock (near Penarth in Wales) from Flat Holm. The message sent was "ARE YOU READY". From his Fraserburgh base, he transmitted the first long-distance, cross-country wireless signal to Poldhu in Cornwall.[when?] His star rising, he was soon sending signals across The English channel (1899), from shore to ship (1899) and finally across the Atlantic (1901). A study of these demonstrations of radio, with scientists trying to work out how a phenomenon predicted to have a short range could transmit "over the horizon", led to the discovery of a radio reflecting layer in the Earth's atmosphere in 1902, later called the ionosphere. Radiotelegraphy proved effective for rescue work in sea disasters by enabling effective communication between ships and from ship to shore. In 1904, Marconi began the first commercial service to transmit nightly news summaries to subscribing ships, which could incorporate them into their on-board newspapers. A regular transatlantic radio-telegraph service was finally begun on 17 October 1907. Notably, Marconi's apparatus was used to help rescue efforts after the sinking of Titanic. Britain's postmaster-general summed up, referring to the Titanic disaster, "Those who have been saved, have been saved through one man, Mr. Marconi...and his marvellous invention." "Telegram" redirects here. For other uses, see Telegram (disambiguation). A telegram service is the delivery of written messages that have been sent by telegraph to a local telegraph office. The message is printed on a ticker tape machine and the lengths of tape pasted to a form. The messages are then delivered by hand to the addressee. Sending congratulatory, or greetings telegrams was a popular use of the system once the cost had fallen to something affordable by many. By 1899, the average cost of a Western Union telegram had fallen to only 30 cents. :276 In 1912, Western Union launched telegram forms decorated for birthdays, Christmas etc. They followed this in 1934 with a flat rate for standardised special messages (normally, telegraph messages were charged per word). :274 Faced with the rise of e-mail and mobile phone text messaging, Western Union finally closed their telegram service in 2006. Numerous other companies still offer a telegram service, but the messages are usually not transmitted by a telegraph system. The average length of a telegram in the 1900s in the US was 11.93 words; more than half of the messages were 10 words or fewer. According to another study, the mean length of the telegrams sent in the UK before 1950 was 14.6 words or 78.8 characters. For German telegrams, the mean length is 11.5 words or 72.4 characters. At the end of the 19th century, the average length of a German telegram was calculated as 14.2 words. Telex (TELegraph EXchange) was a public switched network of teleprinters. It used rotary-telephone-style pulse dialling for automatic routing through the network. It initially used the Baudot code for messages. Telex development began in Germany in 1926, becoming an operational service in 1933 run by the Reichspost (Reich postal service). It had a speed of 50 baud – approximately 66 words-per-minute. Up to 25 telex channels could share a single long-distance telephone channel by using voice frequency telegraphy multiplexing, making telex the least expensive method of reliable long-distance communication. Telex was introduced into Canada in July 1957, and the United States in 1958. A new code, ASCII, was introduced in 1963 by the American Standards Association. ASCII was a 7-bit code and could thus support a larger number of characters than Baudot. In particular, ASCII supported upper and lower case whereas Baudot was upper case only. The telegraph freed communication from the time constraints of postal mail and revolutionized the global economy and society. By the end of the 19th century, the telegraph was becoming an increasingly common medium of communication for ordinary people. The telegraph isolated the message (information) from the physical movement of objects or the process. There was some fear of the new technology. According to author Allan J. Kimmel, some people "feared that the telegraph would erode the quality of public discourse through the transmission of irrelevant, context-free information." Henry David Thoreau thought of the Transatlantic cable "...perchance the first news that will leak through into the broad flapping American ear will be that Princess Adelaide has the whooping cough." Kimmel says these fears anticipate many of the characteristics of the modern internet age. Initially, the telegraph was expensive to use, so was mostly limited to businesses that could use it to improve profits. The telegraph had an enormous effect on three industries; finance, newspapers, and railways. Telegraphy facilitated the growth of organizations "in the railroads, consolidated financial and commodity markets, and reduced information costs within and between firms". In the US, there were 200 to 300 stock exchanges before the telegraph, but most of these were unnecessary and unprofitable once the telegraph made financial transactions at a distance easy and drove down transaction costs. :274-275 This immense growth in the business sectors influenced society to embrace the use of telegrams once the cost had fallen. Worldwide telegraphy changed the gathering of information for news reporting. Journalists were using the telegraph for war reporting as early as 1846 when the Mexican–American War broke out. News agencies were formed, such as Associated Press, for the purpose of reporting news by telegraph. :274-275 Messages and information would now travel far and wide, and the telegraph demanded a language "stripped of the local, the regional; and colloquial", to better facilitate a worldwide media language. Media language had to be standardized, which led to the gradual disappearance of different forms of speech and styles of journalism and storytelling. Numerous newspapers and news outlets in various countries, such as The Daily Telegraph in Britain, The Telegraph in India, De Telegraaf in the Netherlands, and the Jewish Telegraphic Agency in the US, were given names which include the word "telegraph" due to their having received news by means of electric telegraphy. Some of these names are retained even though more sophisticated means are now used. ^ Samuel F. B. Morse, Examination of the Telegraphic Apparatus and the Processes in Telegraphy, pages 7–8, Philp & Solomons 1869 OCLC 769828711. ^ "Cablegram - Definition of cablegram by Merriam-Webster". merriam-webster.com. ^ "1,796 memos from US embassy in Manila in WikiLeaks 'Cablegate'". ABS–CBN Corporation. 29 November 2010. Retrieved 29 November 2010. ^ Definition of "cable", The Macquarie Dictionary (3rd ed.). Australia: Macquarie Library. 1997. ISBN 978-0-949757-89-0. (n.) 4. a telegram sent abroad, especially by submarine cable. (v.) 9. to send a message by submarine cable. ^ Christopher H. Sterling, "Great Wall of China", pp. 197-198 in, Christopher H. Sterling (ed), Military Communications: From Ancient Times to the 21st Century, ABC-CLIO, 2008 ISBN 1851097325. ^ Morris Rossabi, From Yuan to Modern China and Mongolia, p. 203, Brill, 2014 ISBN 9004285296. ^ a b David L. Woods, "Ancient signals", pp. 24-25 in, Christopher H. Sterling (ed), Military Communications: From Ancient Times to the 21st Century, ABC-CLIO, 2008 ISBN 1851097325. ^ "The Origin of the Railway Semaphore". Mysite.du.edu. Retrieved 2013-06-17. ^ Burns, Francis W. (2004). Communications: An International Historyof the Formative Years. IET. ISBN 978-0-86341-330-8. ^ "A Semaphore Telegraph Station", Scientific American Supplement, 20 April 1895, page 16087. 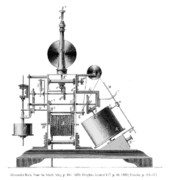 ^ Jones, R. Victor Samuel Thomas von Sömmering's "Space Multiplexed" Electrochemical Telegraph (1808–10), Harvard University website. Attributed to "Semaphore to Satellite", International Telecommunication Union, Geneva 1965. ^ Norman, Jeremy. "Francis Ronalds Builds the First Working Electric Telegraph(1816)". HistoryofInformation.com. Retrieved 1 May 2016. ^ Ronalds, B.F. (2016). "Sir Francis Ronalds and the Electric Telegraph". Int. J. For the History of Engineering & Technology. 86: 42–55. doi:10.1080/17581206.2015.1119481. ^ Jay Clayton, "The voice in the machine", ch. 8 in, Jeffrey Masten, Peter Stallybrass, Nancy J. Vickers (eds), Language Machines: Technologies of Literary and Cultural Production, Routledge, 2016 ISBN 9781317721826. 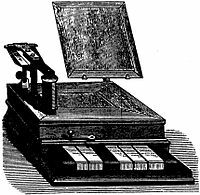 ^ "Milestones:Shilling's Pioneering Contribution to Practical Telegraphy, 1828–1837". IEEE Global History Network. IEEE. Retrieved 26 July 2011. ^ a b Lewis Coe, The Telegraph: A History of Morse's Invention and Its Predecessors in the United States, McFarland, p. 69, 2003 ISBN 0786418087. ^ a b c d David L. Woods, "Heliograph and mirrors", pp. 208-211 in, Christopher H. Sterling (ed), Military Communications: From Ancient Times to the 21st Century, ABC-CLIO, 2008 ISBN 1851097325. ^ Nelson A. Miles, Personal Recollections and Observations of General Nelson A. Miles, vol. 2, pp. 481-484, University of Nebraska Press, 1992 ISBN 0803281811. ^ "David Edward Hughes". Clarkson University. April 14, 2007. Archived from the original on 2008-04-22. ^ Beauchamp, K.G. (2001). History of Telegraphy: Its Technology and Application. IET. pp. 394–395. ISBN 978-0-85296-792-8. ^ a b Richard E. Smith, Elementary Information Security, p. 433, Jones & Bartlett Publishers, 2015 ISBN 1284055949. ^ Anton A. Huurdeman, The Worldwide History of Telecommunications, p. 72, Wiley, 2003 ISBN 0471205052. ^ Ken Beauchamp, History of Technology, p. 87, Institution of Engineering and Technology, 2001 ISBN 0852967926. ^ Lewis Coe, The Telegraph: A History of Morse's Invention and Its Predecessors in the United States, pp. 16-17, McFarland, 2003 ISBN 0786418087. ^ a b Tom Standage, The Victorian Internet, Berkely, 1999 ISBN 0-425-17169-8. ^ Haigh, K R (1968). Cable Ships and Submarine Cables. London: Adlard Coles Ltd. pp. 26–27. ^ a b Solymar, Laszlo. The Effect of the Telegraph on Law and Order, War, Diplomacy, and Power Politics" in Interdisciplinary Science Reviews, Vol. 25, No. 3, pp. 204 f. 2000. Accessed 1 Aug 2014. ^ G.C. Mendis (1952). Ceylon Under the British. Asian Educational Services. p. 96. ISBN 978-81-206-1930-2. ^ Briggs, Asa and Burke, Peter: "A Social History of the Media: From Gutenberg to the Internet", p110. Polity, Cambridge, 2005. ^ a b Kennedy, P. M. (October 1971). "Imperial Cable Communications and Strategy, 1870–1914". The English Historical Review. 86 (341): 728–752. doi:10.1093/ehr/lxxxvi.cccxli.728. JSTOR 563928. ^ Headrick, D.R., & Griset, P. (2001). 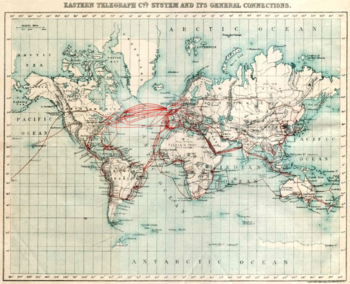 Submarine telegraph cables: business and politics, 1838–1939. The Business History Review, 75(3), 543–578. ^ "The Institute of Chemistry - The Hebrew University of Jerusalem". huji.ac.il. Archived from the original on May 6, 2008. ^ First Atlantic Ocean crossing by a wireless signal. aerohistory.org. Retrieved on 12 July 2012. ^ John W. Klooster (2009). Icons of Invention: The Makers of the Modern World from Gutenberg to Gates. ABC-CLIO. p. 161. ISBN 978-0-313-34743-6. ^ "Marconi: Radio Pioneer". BBC South East Wales. Retrieved 2008-04-12. ^ "Letters to the Editor: Marconi and the History of Radio". IEEE Antennas and Propagation Magazine. 46 (2): 130. 2004. doi:10.1109/MAP.2004.1305565. ^ Victor L. Granatstein (2012). Physical Principles of Wireless Communications, Second Edition. CRC Press. p. 8. ISBN 978-1-4398-7897-2. ^ "The Clifden Station of the Marconi Wireless Telegraph System". Scientific American. 23 November 1907. ^ Second Test of the Marconi Over-Ocean Wireless System Proved Entirely Successful. Sydney Daily Post. 24 October 1907. ^ a b c d e f g h i j k l Ronnie J. Phillips, "Digital technology and institutional change from the gilded age to modern times: The impact of the telegraph and the internet", Journal of Economic Issues, vol. 34, iss. 2, pp. 267-289, June 2000. ^ Tom Standage, The Victorian Internet, Afterword, Walker & Company, 2007 ISBN 978-0-802-71879-2. ^ Hochfelder, David (2012). The Telegraph in America, 1832–1920. The Johns Hopkins University Press. p. 79. ISBN 9781421407470. ^ a b c Frehner, Carmen (2008). Email, SMS, MMS: The Linguistic Creativity of Asynchronous Discourse in the New Media Age. Bern: Peter Lang AG. pp. 187, 191. ISBN 9783039114511. ^ Allan J. Kimmel, People and Products: Consumer Behavior and Product Design, pp. 53-54, Routledge, 2015 ISBN 1317607503. Britton, John A. Cables, Crises, and the Press: The Geopolitics of the New International Information System in the Americas, 1866–1903. (University of New Mexico Press, 2013). Fari, Simone. Formative Years of the Telegraph Union (Cambridge Scholars Publishing, 2015). Fari, Simone. Victorian Telegraphy Before Nationalization (2014). Hochfelder, David, The Telegraph in America, 1832–1920 (Johns Hopkins University Press, 2012). John, Richard R. Network Nation: Inventing American Telecommunications (Harvard University Press; 2010) 520 pages; the evolution of American telegraph and telephone networks. Kieve, Jeffrey L. (1973). The Electric Telegraph: a Social and Economic History. David and Charles. ISBN 0-7153-5883-9. Lew, B., and Cater, B. "The Telegraph, Co-ordination of Tramp Shipping, and Growth in World Trade, 1870–1910", European Review of Economic History 10 (2006): 147–73. Müller, Simone M., and Heidi JS Tworek. "'The telegraph and the bank': on the interdependence of global communications and capitalism, 1866–1914." Journal of Global History 10#2 (2015): 259–283. Richardson, Alan J. "The cost of a telegram: Accounting and the evolution of international regulation of the telegraph." Accounting History 20#4 (2015): 405–429. Standage, Tom (1998). The Victorian Internet. Berkley Trade. ISBN 0-425-17169-8. Thompson, Robert Luther. Wiring a continent: The history of the telegraph industry in the United States, 1832–1866 (Princeton UP, 1947). Wenzlhuemer, Roland. "The Development of Telegraphy, 1870–1900: A European Perspective on a World History Challenge." History Compass 5#5 (2007): 1720–1742. Winseck, Dwayne R., and Robert M. Pike. Communication & Empire: Media, Markets & Globalization, 1860–1930 (2007), 429pp. Armagnay, Henri (1908). "Phototelegraphy". Annual Report of the Board of Regents of the Smithsonian Institution: 197–207. Retrieved 2009-08-07. Gray, Thomas (1892). "The Inventors Of The Telegraph And Telephone". Annual Report of the Board of Regents of the Smithsonian Institution: 639–659. Retrieved 2009-08-07. Pichler, Franz, Magneto-Electric Dial Telegraphs: Contributions of Wheatstone, Stoehrer and Siemens, The AWA Review vol. 26, (2013). Wilson, Geoffrey, The Old Telegraphs, Phillimore & Co Ltd 1976 ISBN 0-900592-79-6; a comprehensive history of the shutter, semaphore and other kinds of visual mechanical telegraphs. Wikimedia Commons has media related to Telegraphy. "Telegraph" . Encyclopædia Britannica (11th ed.). 1911. Western Union Telegraph Company Records, 1820–1995 Archives Center, National Museum of American History, Smithsonian Institution.